The Common Pauraque is nocturnal, like all nightjars. This species breeds in the warmer climates of North America, from southern Texas to northern Argentina. Most of the populations of the Common Pauraque are residents, but some in the United States will migrate to Mexico in winter months. The preferred habitat of this species includes open wooded or grasslands, scrubs and crops. They also like to have dense foliage available for hiding space, and require access to rivers and wetlands for hunting. The Common Pauraque hunts at night for flying insects, and does not build a nest. The conservation rating for the Common Pauraque is Least Concern. Common Pauraque: Medium nightjar with dark-streaked, mottled gray upperparts, white throat, black chin, rufous face, pale gray-brown underparts. Wings have brown and black bars, white band at base of primaries visible in flight. The gray tail is long, with dark edges and white patches. Common Pauraque: South of Texas Common Paraques are residents, in the lowlands of both coasts of Mexico and Central America and in South America south to Peru in the west and northwest Argentina in the east. Breeding range extends from southern Texas to the lower Paraná River region. Most are all-year residents. Found in semi-open scrub country with thickets and woodland clearings. "Whip" calls given by a female. "puc, puc, puc, puc p'weeEER", "wheet wheet wheeeer"
Central Americans know the “white-necked night-runner” as “Don Pucuyo” or “Cabellero de la Noche” (“Gentleman of the Night”)—names reflecting its association with love and presumed amorous influence over young women. In hot weather, they often open their mouths wide and vibrate the throat area, a behavior known as gular-fluttering. Like panting, it’s a thermoregulation behavior that helps to cool the body by increasing the rate of evaporation through the mouth. It has rictal bristles, which are modified feathers resembling stiff hairs alongside its mouth. Highly tactile and controlled by specialized muscles, they are thought to aid in night feeding, and protect the bird’s eyes from flailing insect legs and wings. The genus and species names reflect the Common Pauraque’s appearance and behavior. Nyctidromus means “night-runner,” in reference to the bird’s nocturnal, low-to-the-ground foraging. The species name, albicollis, describes the white, bib-like splotch on the pauraque’s throat. In the taxonomic order CAPRIMULGIFORMES (pronounced ka-pri-muhl-gih-FOR-meez), there are four families of birds; the frogmouths of Asia and Australia, the similar potoos of Central and South America, the Oilbird, and the nightjars. Ninety-two species of goatsuckers in sixteen genera are included in the Caprimulgidae (pronounced ka-pri-MUHL-gih-dee) family, a group found on all continents except for Antarctica. In North America, twenty-three species of goatsuckers genera have occurred (including the extinct Jamaican Pauraque). Members of this family include the aerial nighthawks and the vociferous Whip-poor-will. The goatsuckers are known for their highly camouflaged (cryptic) plumage and for their distinctive vocalizations, the names of the Whip-poor-will and Chuck-will’s-widow actually sounding like their respective vocalizations. 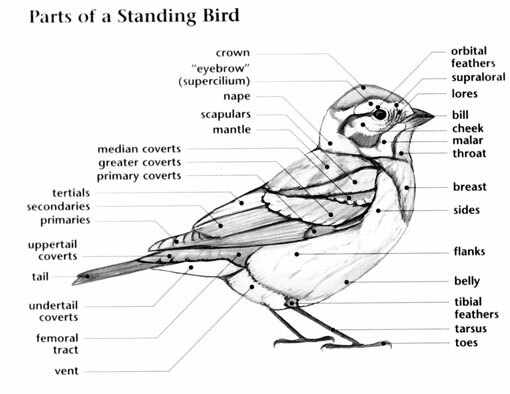 Small to medium sized birds, members of the Caprimulgidae have large, rounded heads, long wings, longish tails, short legs, and small feet. Their bills are distinctive in being very short but with a wide gape that imparts a large-mouthed appearance upon opening the bill. Rictal bristles bordering the gape aid in catching insect prey. Shades of brown mixed with gray, white, and black are the predominant colors in the plumages of nightjars. These form beautiful cryptic patterns that resemble dead leaves, rocky ground, and other natural backgrounds. 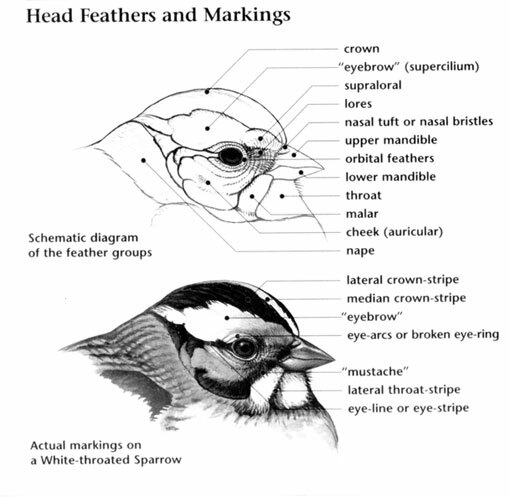 White markings used for signaling are often found on the throat, in the wings, and on the tail. Goatsuckers occur in habitats throughout North America except the tundra. The most widespread species is the Common Nighthawk, a bird of open country and clearings that has become adapted to nesting on the flat roofs of buildings. Other species are adapted to eastern and southern woodlands (the Whip-poor-will and Chuck-will’s-widow), non-forest habitats of the west (the Common Poorwill), and deserts (the Lesser Nighthawk). Two species are uncommon or rare – one in southern Florida (the Antillean Nighthawk), and another in southern Arizona (the Buff-collared Nightjar). All North American members are long distance migrants except for the Common Poorwill, a short distance migrant to Mexico. Although Common Nighthawks can occur in large flocks during migration, nightjars are typically solitary in nature, and are primarily nocturnal. Nighthawks can also be seen foraging at dusk and dawn as they flutter around for insects in the sky. The other nightjars forage by sallying for insects from perches on the ground or low vegetation. Goatsuckers are not endangered in North America although populations of the Whip-poor-will have declined in the northeastern United States as a result of habitat destruction. To the delight of birders and dismay of some campers, the Whip-poor-will can sing for hours on end during the night. One bird was recorded singing its name over 1,000 times in a row. The only bird known to hibernate, the Common Poorwill survives the desert winter in southern California by lowering its body temperature to that of its surroundings. The family name of Caprimulgidae literally means “goat sucker” and comes from the old (and incorrect) belief that these birds snuck into barns at night to feed from the udders of milk goats. The area of the face just below the bill. 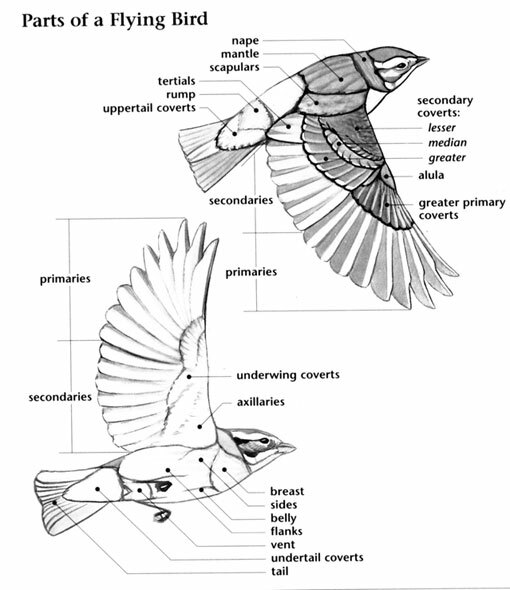 The primaries are the flight feathers specialized for flight. They are attached to the "hand" equivalent part of the wing. Also called commissure, it is the hinge where the mandibles meet. The short and stiff feathers near the bill.